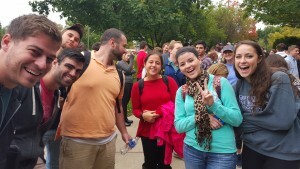 October 1, 2015 by Theresa B. Clarke 0 comments on "You had to be in my 2:00pm section of MKTG 384 to believe this…"
This is a photo of some of my MKTG 384 students catching their breath and slowing down their heart rates after a one-of-a-kind experience learning about fear appeals. In the middle of showing a very gruesome and shocking ad, blaring fire alarms started going off in the building. You had to be there to know just what kind of effect it had on everyone. After the fire alarm, we got settled into class again and some students wanted to know how the ad ended. So I played it again, and in the VERY SAME place as my first showing of the ad, the loud fire alarms started going off again. Several students, including myself, jumped in the air in panic when it happened. Very freaky. If you are so inclined, take a look at the ads. It is a very graphic public service announcement from Western Australia with the message “stay in school”. http://mashable.com/2014/01/30/stay-in-school-psa/… Then imagine a class of students watching this ad with fire alarms blaring around the one minute mark. Crazy! If future classes, I’ll have someone to pull the fire alarms at just the right time to get the full effect.